Reading heat as both metaphor and index, this project is an attempt to reveal the harsh struggle for survival lived daily by millions of refugees and migrants, seen but overlooked, and ignored by many. 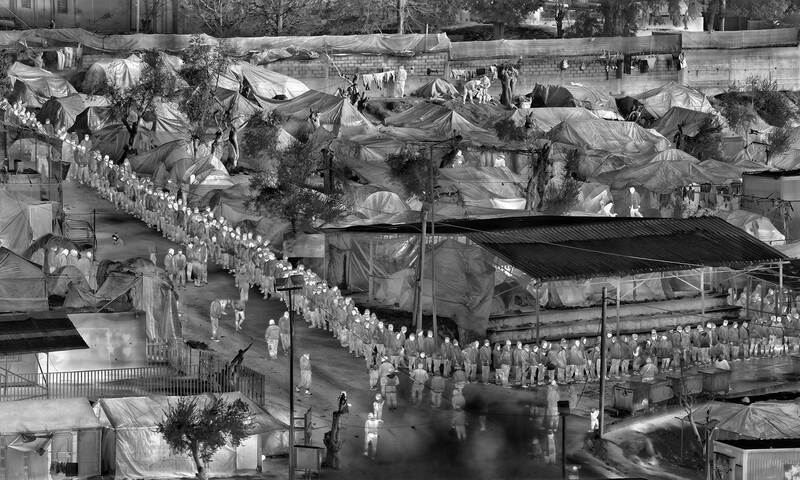 By attaching a thermographic camera to a robotic motion-controlled tripod, Mosse has scanned significant sites in the European refugee crisis from a high eye-level, creating densely detailed panoramic thermal images. Each artwork has been painstakingly constructed from a grid of almost a thousand smaller frames, each with its own vanishing point. Seamlessly blended into a single expansive thermal panorama, these images evoke certain kinds of classical painting, such as those by Pieter Bruegel or Hieronymus Bosch, in the way that they describe space and detail. They show the perimeter fences, security gates, loudspeakers, food queues, tents, and temporary shelters of camp architecture, as well as isolated disembodied traces of human and animal motion and other artifacts that disrupt each precarious composition and reveal its construction. Very large in scale, Heat Maps reveal how large groups of refugees are dealt with by our governments, and the conditions in which they are forced to live in the margins and gutters of our societies.